Limited number of Vouchers for Red Funnel ferry - up to 25% off (for two night or more) available if booked and travelled by 23rd May 2019. 5 Bayclose is a one bedroom apartment with great sea and coastal views over Freshwater Bay. It is situated in a peaceful location and only 5 minutes’ walk from Freshwater Esplanade and beach. Shops and local village are close by. It comes with one numbered and dedicated parking space. 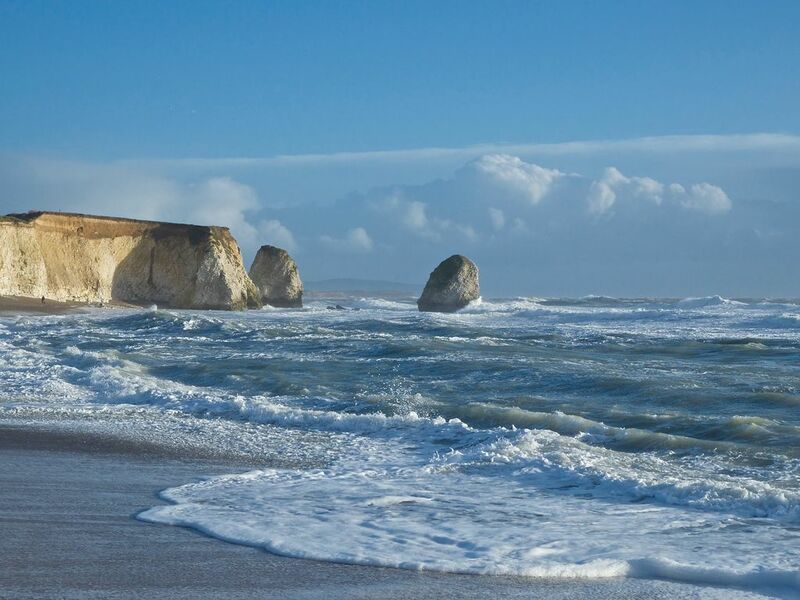 Freshwater Bay is set at the western end of West Wight, the quieter end of the Isle of Wight and set in an area of outstanding natural beauty. The choice of walks from the apartment range from the classic walk over Tennyson Down to the Needles on National Trust Land, countryside or river walks to Yarmouth, Alum Bay, Totland and Colwell Bay and coastal or hill top walks westwards to Compton Bay and beyond to St Catherine’s Point. The apartment is on the first floor and accessed via a staircase. There is no lift. The apartment is only suitable for able bodied guests. Accommodation consists of an integral kitchen, dining and sitting room with fabulous sea views via a large South Eastward facing glazed screen with central French doors. The kitchen is fully fitted with gas hob and oven, fridge with ice making compartment, microwave, dishwasher, DAB radio. The sitting area has a two seater settee and one easy chair, Flat screen TV, which incorporates a DVD and CD player. There are two chairs and a wooden dining table. Free unlimited Wi-Fi is available if you bring your own laptop/tablet but its reliability is variable. The French doors lead out onto the balcony (which is also the means of access to the apartment) and is covered from the weather. A small metal table and 2 chairs are provided for outdoor sitting with removable seat cushions. The double bedroom has a comfortable bed, wardrobe and vanity sitting area. Duvet, pillows and light coloured cotton bed linen are provided – the beds are made up on arrival. The spacious bathroom is off the bedroom and provides a bath with mixer taps and shower over, hand basin, WC and heated towel rail. Two bath sheets and hand towels are provided. Please note – beach towels are NOT provided. The apartment has full gas central heating with radiators which are thermostatically controlled. It is a very well insulated flat and very warm in the winter months. Welcome tea tray is provided for your arrival. The apartments have their own dedicated car sized parking space which cannot be seen from the main road. Each with its own marked flat number in each bay – number 5 is on the end of the row by the fence. No pets and No smoking, either inside or outside on the balcony. No outdoor shoes or boots to be worn in the apartment please as it has a light coloured carpet. Change over day – we aim to be as flexible as possible subject to availability. Arrival time is anytime from 16.00 and departure time is by 11.00. Family Friendly This is a cosy apartment for two people. Note	No pets , No smoking at this property inside or on the balcony. Access	Car advised, designated parking space. Coastal pictures on the website have been provided with grateful thanks by Martin Perry, a local resident, photographer and musician. Available free of charge but can be intermittent and not suitable for large file downloads or streaming. Small metal table with two chairs.